Wednesday Night Whinos: Cocktails and Conversation at The Capital Grille! Wednesday Night Whinos sets an excellent precedent by kicking off the 2013 season with a sophisticated cocktail party at The Capital Grille on January 16th. Wednesday Night Whinos, AroundMainLine.com’s popular ladies social club, kicks off the New Year with one of our favorite and finest friends—The Capital Grille in King of Prussia! All local ladies are welcome to join us in the bar area on Wednesday, January 16th from 6pm to 8pm to network, meet, mingle and celebrate with great gals from around the region. So, what exactly is Wednesday Night Whinos? It is exactly what YOU want it to be! Grab a coworker for a much needed respite and ‘down time’ together, ask your mom or neighbor to join in a great GNO (Girls Night Out), gather your local moms network for a bit of a break from the kiddos and hubs…or just come out as your own fabulous self and have fun with local women who love to socialize and make new friends! RSVP is not required for this event, walk-ins are always welcome. Kindly note, this event is strictly ladies only and is 21 and over. RSVP is not required to attend but it helps us plan accordingly with the great friends of The Capital Grille. Or, send us an email: rsvp@aroundmainline.com. See you all on January 16th my AML ladies! 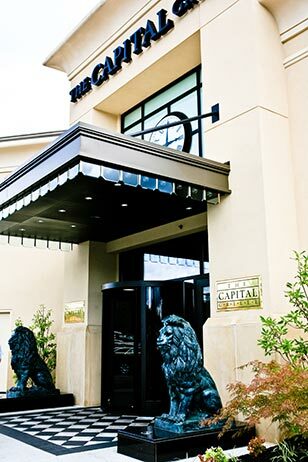 The Capital Grille is located at 236 Mall Blvd in King of Prussia, PA 19460. Want to host a Whinos at your local boutique or restaurant in 2013? Contact us today!